After we left beautiful Athens, we visited Delphi. 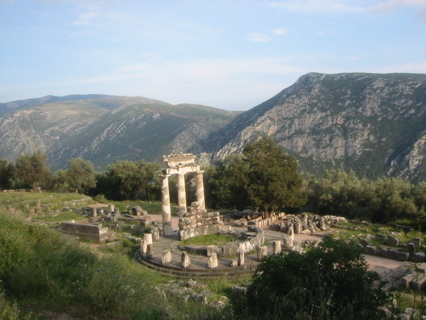 Delphi was built at the location that the ancient Greeks believed was the omphalos, or navel, of the world. According to myth, Zeus sent two eagles to meet at the center of the world, and they landed at Delphi. Can you believe that the view on the left is the view from our hotel room in Delphi? We couldn't believe it, either, but when we woke up the next morning, the view was still there. Wow! From our hotel, we walked to the enormous temple complex at Delphi just down the road. We explored the athletic fields, the amphitheater, the treasury, and many temple buildings with a local guide, and we even saw the omphalos itself, pictured on the left below. 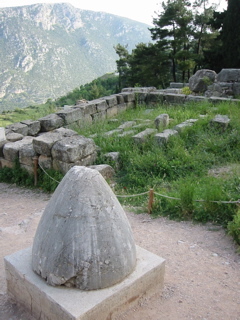 After our guided tour, we wandered further down the road to see more of Delphi's extensive ruins. On the right is the sanctuary of Athena Pronaia at Delphi, built in the fourth century B.C. 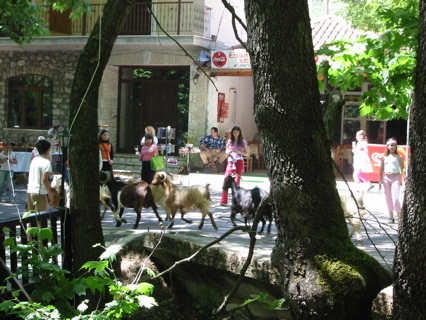 The next day, after crossing via ferry to the Peloponnesian Peninsula, we stopped for lunch at a trout farm in the mountains around Kalavrita. The meal was fresh and delicious, but the children are what we remember most about the day. They were just as eager to try out their basic English as we were to try out our few words of polite Greek. Hello, hello! Yassas, yassas! Next, we made a spontaneous stop at the Cave of the Lakes, where a friendly bilingual tour guide led us and a group of Greeks through the caves together. Unfortunately, the caves were a bit dark for photos.